It might come as a surprise to know that our wonderful Maleny Neighbourhood Centre (MNC) receives no government funding whatsoever. A community resource that is so vital and has so much to offer is fully funded by the community it supports. Maleny Supa IGA’s Community Benefits Club (CBC) is just one form of funding that helps the centre keep its doors open. To date, over $15,000 CBC dollars have been distributed directly into MNC projects. Manager, Cath Ovenden says it’s a great help, yet so much more is needed to ensure MNC continues to provide much needed community support and community development services. Businesses are often unaware MNC has six meeting rooms plus IT equipment for hire, like data projectors. You can even hire MNC’s commercial kitchen. MNC provides a vital role in the community not only to those undergoing trauma and struggling times, but also in fostering community development and innovative projects. Now for the first time business memberships are available as another way you can support the work of MNC. MNC is home to many wonderful initiatives and hires its rooms to a wide range of groups. There’s the Flexi School which provides a much needed service to high school students. Dr Bob Jacobs provides free workshops for parents and Jelly is a group of computers/internet workers who get together for some social interaction and an exchange of ideas. Hinterland Community Development Worker, Holly Aston is based at MNC three days per week. There are parent support groups, meditation groups, art therapy and free massages. LETS (Local Energy Exchange System) use the facilities for its monthly markets and on any given day you’ll find choir rehearsals, marimba classes and family constellation training. The recent addition of the Fix-it Café where people bring along their broken items to be repaired happens fortnightly. On Christmas Day, MNC hosts its biggest event of the year with the Free Christmas Breakfast, strongly supported by many groups, businesses and individuals. MNC has recorded cases involving domestic violence and homelessness - people living in cars or tents; some with young families. People can come in off the streets and have a hot shower or do their washing. Apart from practical help, MNC provides a place for social contact, offers employment training, financial guidance, community garden, counseling and life coaching. MNC has many ways for people to get involved as Cath explains. Contribute to our emergency relief cupboard. Bring us your ideas, enthusiasm, room bookings etc to Cath. "Make an appt to find out what we do and come and help your community thrive.” MNC helps grow a more resilient Maleny. 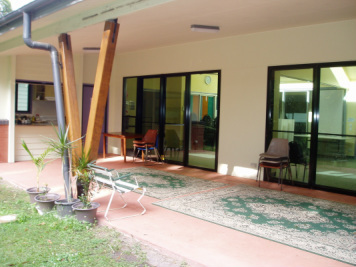 Visit Maleny Neighbourhood Centre online or in person at 17 Bicentenary Lane or give Cath a ring on 07 5499 9345. LIKE their Facebook Page. Sign up now to the Maleny IGA CBC. CBC Feature on Maleny Neighbourhood Centre (MNC) by Maleny Supa IGA is licensed under a Creative Commons Attribution-NonCommercial-NoDerivs 3.0 Unported License. Based on a work at http://www.malenyiga.com.au.